1. 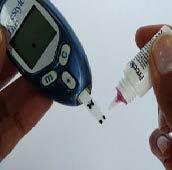 Do a control solution test: Control solution is a liquid with a given glucose concentration range, printed on strip insert in the pack (FreeStyle Optium) or vial of strips (FreeStyle Lite). Control solution can be obtained from the Customer Care team free of charge (UK - 0500 467 466 and Ire - 1800 77 66 33). Used with one of your regular test strips, control solution lets you check whether your meter is working correctly. Control Solution results are to be compared to expected results printed on strip insert package (FreeStyle Optium) or vial of strips (FreeStyle Lite). 2. Line up a spare meter battery or two: Have you ever been caught out when your meter battery gave up the ghost, or has a little symbol indicating low battery life recently appeared on your meter screen? Now’s as good a time as any to be prepared! Most of our FreeStyle blood glucose meters use small, flat CR2032 type batteries you won’t necessarily have at home for other devices, but can be purchased from an electronics shop or most supermarkets. The easiest way to find out which battery, and how many, your FreeStyle blood glucose meter needs is to check our specification chart. 3. Confirm the time on your meter: We usually think of changing the times on electronics when the clocks go forward or back – but did you get as far as your meter in October? It’s not too late to benefit from changing the time on the FreeStyle Optium Neo and the FreeStyle InsuLinx. Having the right time on your meter helps you and your diabetes care team identify patterns in your glucose results. If your meter offers built-in trend analysis, like the FreeStyle Optium Neo, setting the time correctly will help you get the most out of using it.